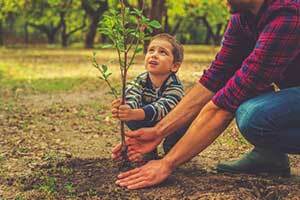 Many parents who value our environment and strive to maintain eco-friendly households want to teach their kids how to respect the environment, but it can be hard to know where to start with these lessons. You may wonder how you can get your kids to understand the importance of recycling. Or, you might want them to have a deeper understanding of how humans affect nature. You could also want your kids to have a better idea of where their food comes from, or why littering is so bad for the environment. If you’re looking for ways to teach your kids the importance of living an eco-friendly lifestyle, these tips are for you! You already make lots of environmentally-friendly choices in your day-to-day life, like recycling or avoiding plastic products. Your kids may not realize that you make these choices to help the environment. They may just think that it’s something that everyone does. To help them better understand what you’re doing, be sure to explain all of the eco-friendly choices you’re making. One easy environmental choice you can explain is recycling. When you’re recycling, tell your kids why you recycle and how these products will be reused. Show them videos and photos of recycling plants, and explain what it means to reduce, reuse, and recycle. You can also have them help you sort out the recycling to give them hands-on experience. 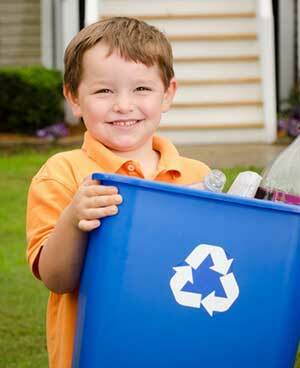 Teaching your kids about recycling will give them a deeper appreciation and understanding for why it’s so important. A great skill to teach your kids is how to reuse items. Have your kids create art projects with items like cardboard paper towel rolls, shoe boxes, and old newspapers. You can also use other items that you would have normally thrown out in these art projects. For example, if you have a few old shirts with holes lying around, cut them up and use the fabric scraps to create a colorful collage. Before you throw out an old or broken item, ask your kids if they think of any creative ways to use it. Single-use disposable products like plastic water bottles, paper plates, and plastic forks and knives cause tons of unnecessary waste. Try to avoid using these items as much as possible. Instead of buying plastic water bottles, buy one reusable bottle. Be sure to explain to your kids why the reusable bottle is so much better for the environment. Also, explain what landfills are to your kids and tell them why it’s so important to avoid creating unnecessary garbage. Spending time outdoors will give your kids a greater appreciation of the environment. Head to your favorite local park and take a long walk through the woods. Bring a book with you that shows local flora and fauna, and work with your kids to identify the plants and animals that you see. You can also take your kids camping for a night or two to give them an amazing immersive nature experience. Or, you could consider taking a family vacation to a natural wonder, like the Grand Canyon or Niagara Falls. Doing this will show your kids how amazing nature can be. One good way to help your kids understand where their food comes from is to plant a fruit and vegetable garden. You can just plant a small plot, or you can go all-out and create a huge fruit and vegetable garden in your backyard. Have your kids help you tend the garden. Also, let them choose some of the fruits and vegetables you plant. This will get them really excited about gardening. Planting a garden will help your kids feel much more connected to the Earth. Volunteering for an eco-friendly cause is a good way to get your kids involved in the local environmental community. If you live near the beach, sign up for a shore clean-up. You can also see if any of your local parks are looking for volunteers to help pick-up litter. Volunteering for a local clean-up is an easy way to show kids why it’s important not to litter. It’s also a good way to introduce your kids to other kids who are working to help the environment. Your kids will love having someone their own age to talk to about these issues. Books are always a great place to turn if you need help teaching your kids about the importance of respecting the environment. Start with some classic eco-friendly books, like “The Lorax” by Dr. Seuss or “The Giving Tree” by Shel Silverstein. Read through the books with your kids, and afterwards, ask them about the lessons they learned. Explain how the lessons in these books can be applied to the real world, and answer any questions they have about what they can do to help the environment. Eco-friendly movies are also useful for helping kids understand the best ways to respect the environment. Show them some animated films with an environmental message, like “Ferngully” or “Wall-E.” Or, you can watch kid-friendly documentaries , like “Article Tale,” “March of the Penguins,” and “Planet Earth.” Make some popcorn and watch one of these films during a family movie night. Afterwards, discuss the movie with your kids. If you want to grow an eco-friendly family, start by making some small changes in your home. Teach your children the importance of recycling, spend time out in nature with them, and answer any question that they have about ways to respect the environment. It’s also a good idea to use eco-friendly products in your home, and explain to your kids why these products are better for the environment than other products. If you’re looking for eco-friendly products for your kitchen, check out Kangovou’s line of BPA and lead free kids’ dishware. If you teach your kids how to respect the environment when they’re young, you’ll set up a lifetime of good habits.